How do I Choose the Best Commercial Thermostat? Programmable thermostats can be set to power up before the work day and lower temperatures at night. To choose the best commercial thermostat, it would be wise to know the required heating and cooling schedule for your business or commercial facility, then choose the thermostat that delivers the features you require. Most programmable commercial thermostats for businesses come with an array of features that allow businesses to maintain good temperatures conducive to productivity while the office or facility is in heavy use. When the office or facility is unoccupied after the close of business, a good programmable thermostat can change the temperature setting to save energy and money. A commercial thermostat also can come with a photocell light sensitivity that changes the settings as soon as the last employee leaves for the day. There are many commercial thermostats with many flexible features, and the right match is more within reach now that programmable thermostats have mostly replaced the old mechanical thermostats of yesteryear. Before you start to investigate dealers online or in person, you will need to know beforehand the brand and model of your heating/cooling plant and what voltage and pole/throw configuration that plant has. Decide whether you want the programming instructions on the inside of the thermostat cover with easy-to-understand symbols or would rather be able to consult an instruction booklet showing every possible option for settings and control. Having a large, easy-to-read screen is also helpful so that the employees responsible for settings or adjustments won’t have to use a magnifier to read the screen. 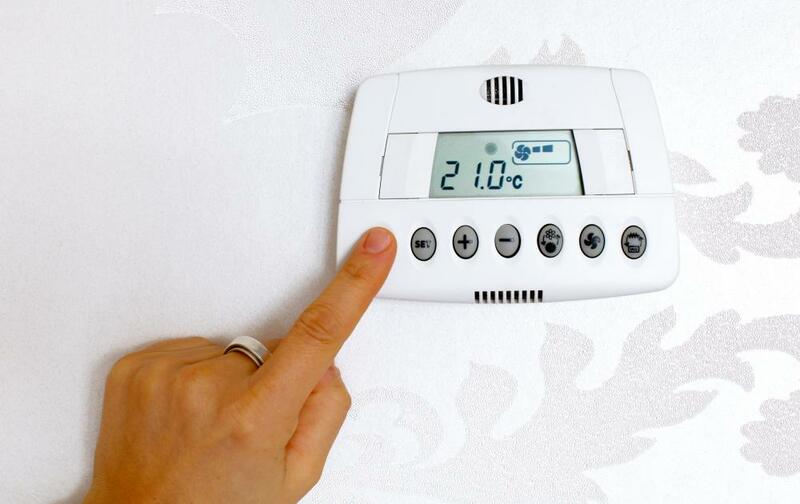 To choose the best commercial thermostat, you also will need to decide which other features it should have. Among the features that any business office or industrial facility can appreciate are the flexibility of programmable thermostats to fit the days and hours your office or facility is open. If your business is open only on weekdays or is closed on certain days, you can program the thermostat to save you money during those times the building is unoccupied. Yet, these same thermostats can also be programmed to adjust the cooling or heating temperatures ahead of time so no one arrives to an office that is too hot or too cold. The use of smart fans also can be programmed in these commercial thermostats to refresh from outside air a couple of hours before anyone arrives. The flexibility doesn’t end there. If your facility sometimes rearranges workstations and tools to perform different tasks, you might choose to purchase wireless commercial thermostats. Using a receiver and several of these mobile thermostats that can be placed anywhere in the building can help ensure that heating or cooling is delivered where and when it is needed. A commercial thermostat also can have battery backup for when the power is lost. There are even programmable thermostats that you can adjust from your computer or smartphone. Many also can be programmed to ensure that only a limited number of employees can adjust them by means of a code, or you can purchase locking covers and dispense the keys sparingly. How Do I Choose the Best Locking Thermostat Cover? How Do I Choose the Best Wireless Programmable Thermostat? What Is a Network Thermostat? What is a Radiator Thermostat? What is an Underfloor Heating Thermostat? What is a Lockable Thermostat? How do I Choose the Best Thermostat Cover?